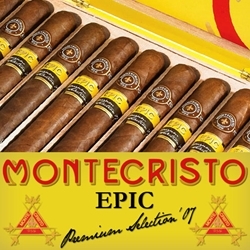 Montecristo Epic blend hand-rolled premium cigars are individually fashioned with a select aged Ecuadorian Habano wrapper, a Nicaraguan binder, and vintage Nicaraguan and Dominican fillers. Each of these premium cigars are handcrafted by the most skilled and accomplished cigar makers – the Grupo de Maestros. Montecristo Epic premium cigars are created with the finest aged tobaccos and packaged carefully inside a beautifully painted and stylish cedar cigar box that includes a certificate of authenticity. The Epic premium cigar line produces a more fuller-bodied smoke than other blends from the Montecristo cigar collection, with rich notes of chocolate, nuts, coffee, fruit, and caramel. Smokers Discounts believes you'll love Montecristo Epic premium cigars. We’ve made it easy and affordable to buy these hand-rolled cigars online. A variety of sizes and flavors are listed below in our online cigar store. Each of these styles are in stock and available today for a low discount price. Call us for more details!